Members of the Cincinnati Chapter of the Federal Bar Association. Members of the Ohio Women's Bar Association and/or the Cincinnati Bar Association. 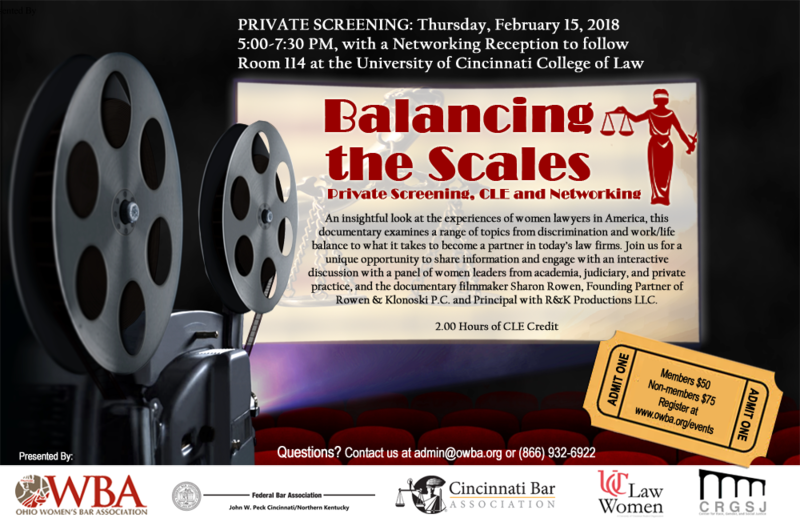 The Ohio Women's Bar Association, Cincinnati Bar Association and Cincinnati Chapter of the Federal Bar Association in conjunction with the University of Cincinnati College of Law’s Center for Race, Gender, & Social Justice and UC Law Women will host a private screening of the film Balancing the Scales at the University of Cincinnati College of Law on Thursday, February 15. Following the screening, there will be an opportunity to engage with an interactive panel discussion with the documentary filmmaker, Sharon Rowen, and women lawyers from academia, judiciary, and private practice. The event will conclude with a networking reception. This event is approved for 2.00 General CLE Credit Hours. Click here for more information about the film and to view the trailer.